This Gothic Victorian Crescent Moon Jewelry Necklace is another of our favorite pieces! 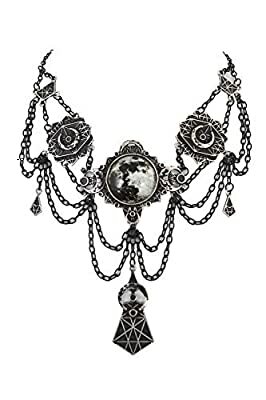 In another quality and unique piece from Restyle, this choker necklace will attract loads of comments and compliments at your next Vampire Ball! This moon geometry choker necklace is an absolutely beautiful and amazing piece. 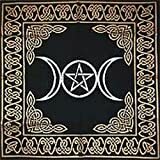 In the center of the choker, there is a full moon glass cabochon and surrounded by geometric metal frame with crescent moons. On the sides, there are metal geometry designed segments with similar decorations. The entire choker bangle is covered with geometry pattern with moon phases on the sides. The each metal segment pieces is adorned with another geometry metal charms with black chains. Entire necklace is filled with black, matte mass which contrast beautifully with silver elements. Main Moon center Piece : 2.75" x 2" / 3.25"